Today on Clarke Couture, I've decided to keep the spirit of Halloween alive for a little longer with this Halloween inspired party make-up look. 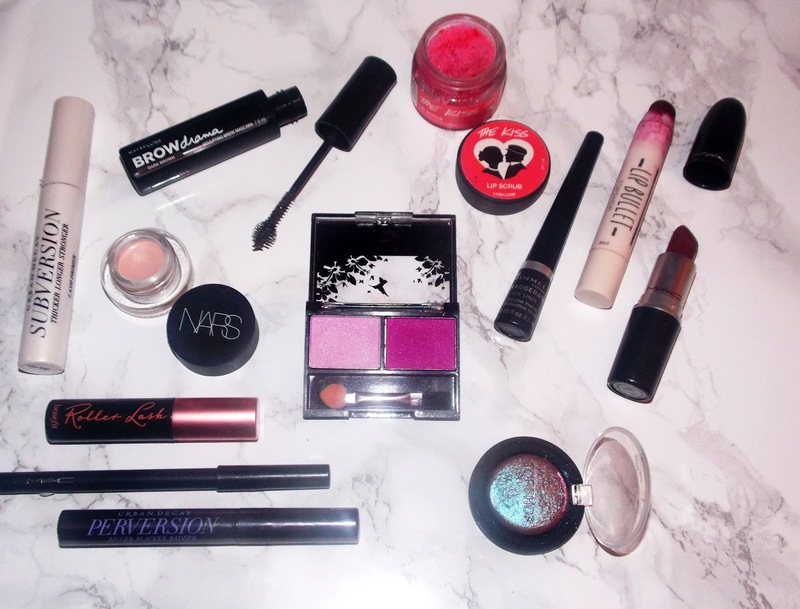 Berry lips, a pop of pink on the eyes and a of course deep contour are the three key elements to this look; I hope you enjoy! 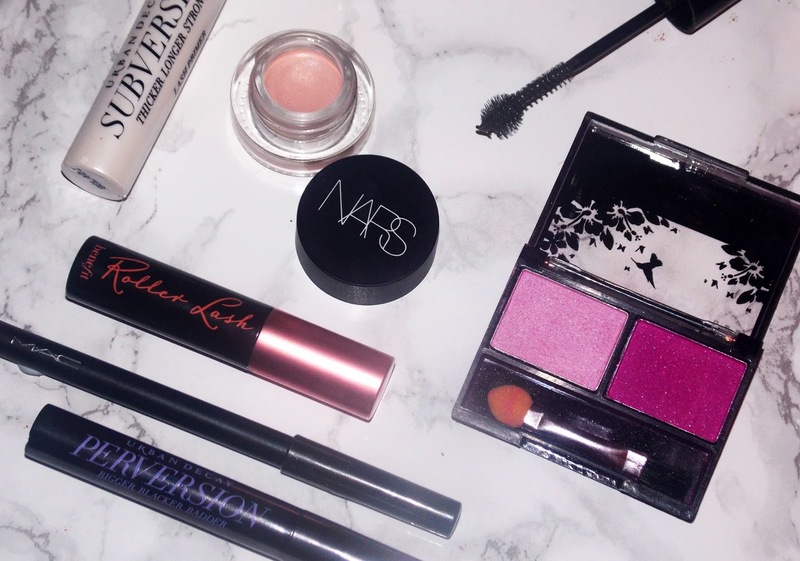 Firstly I've primed my face using the Benefit Stay Flawless 15 Hour Primer to keep our make-up looking flawless all night, then for the eyes the NARS Eye Paint in 'Porto Venere' shall keep my shadow firmly in place. This shade has a pretty, pale pink undertone which further helps to brighten both the eyes and the shadow pigments themselves. Across the lid, using a fluffy brush I've applied 'limit' (Taupe with cool, pink undertones) from the Urban Decay Naked 3 Palette to deepen the look. Smoking out underneath the waterline using this super pigmented hot pink shade from the Mizz Peepers Duo then adding a touch of sparkle to the inner corner with Topshop 'Wax&Wane' a pink shimmer with purple and gold flecks throughout. Lastly, smoking the look further with MAC Kohl Liner in 'Smolder' and Rimmel Exaggerate Liquid Liner in 'Extreme Black'. For the lashes I've primed using the Urban Decay Lash Primer in 'Subversion' followed by the Urban Decay Mascara in 'Perversion' combined with my holy grail Benefit Roller Lash, adding a fluttery finish to my peepers. For the brows, I've lightly coated them using the Maybelline Brow Drama, as I've gone all out with the eyes and lips I decided to keep the brows looking a bit more natural to balance the look out. And of course, my brows are never complete without defining them with a touch of concealer, today I opted for MAC ProLongwear in 'NC15'. This is hands down one of my favourites, super brightening, lifting and when worn under the eyes cancels out any signs of a late night. 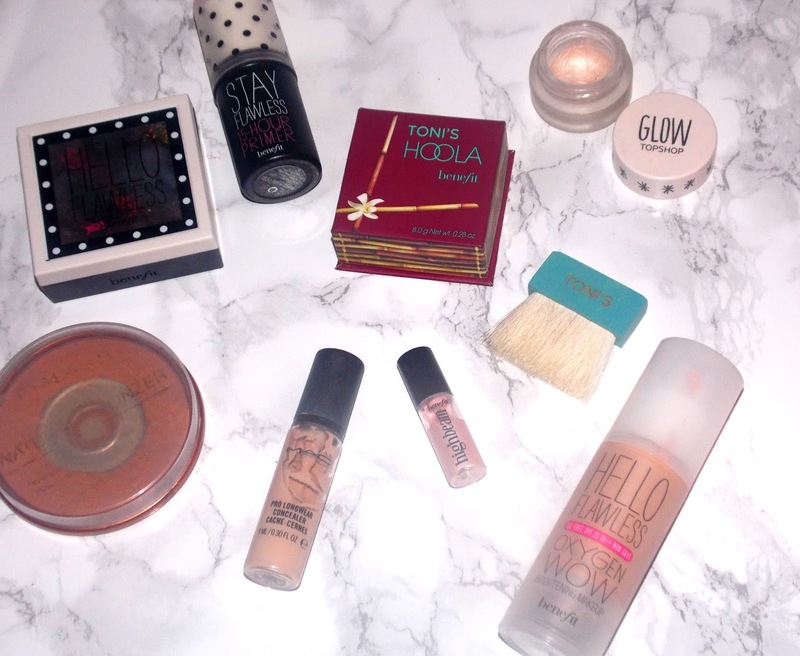 For my base I've used the Benefit Girl Meets Pearl liquid pearl illuminator to brighten up my face for the evening. The formula of this is also pale pink in tone, further complimenting the pop of pink on the eyes. Blending in with the Benefit Hello Flawless Foundation, this gives a very natural finish to the skin with the illusion of 'my skin but better'. Then, lightly dusting over the Benefit Hello Flawless Powder to set the look in place. To add definition to my face, the Benefit Hoola Bronzer is the perfect product for creating a deep, in set contour across my cheekbones, around my hairline and the bridge of my nose. To make the look appear slightly more natural I've blended out using Rimmel Natural Bronzer on a big fluffy brush, further blending out onto my neck and ears. To highlight Topshop Glow Cream in 'Polished' accompanied by Benefit High Beam across my cupid's bow, bridge of my nose and just above my cheekbones to add a further added glow to my face. The glow cream contains a subtle fleck of pink shimmer which compliments my inner corner highlight perfectly. Lastly for my lips, as always I've scrubbed them using my trustee Lush lip scrub before applying 'MAC Diva' a stunning matte burgundy, perfect for this time of year. Dabbing on the Topshop Lip Bullet in 'Wine Gum' (a slightly darker burgundy with purple undertones) across the centre of my lips to darken up the look slightly. Ta-da, that is the final look - just add a setting spray of your choice and you'll be set looking super glam for the night. What is your current go to party/event make-up look? !